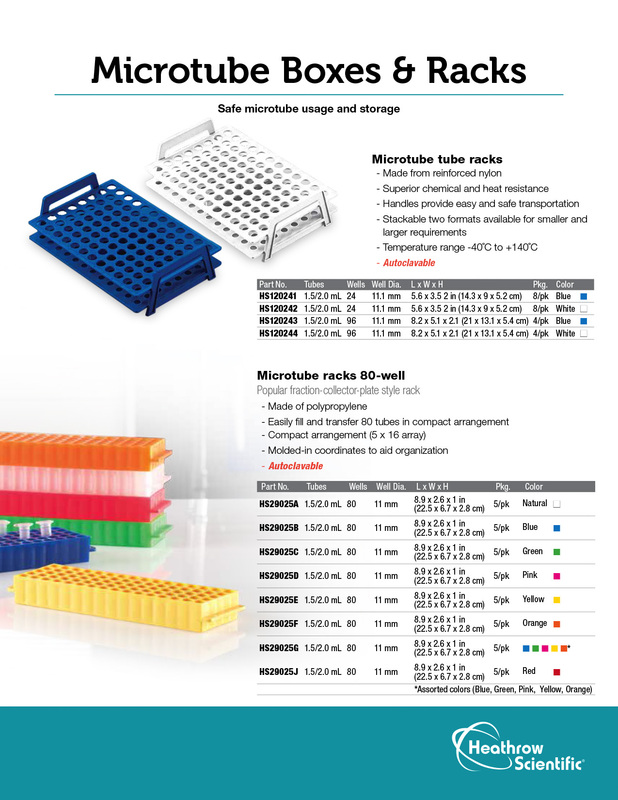 50-well racks hold 1.5 to 2.0ml microtubes and cryovials. Secure clasp holds lid in place during use. Rugged polypropylene racks have molded grid lines on the lid, imprinted and raised coordinates on the box and imprinted coordinates at the base of each well, allowing easy identification. Rack measures 5 1/2" x 3 5/8" x 2 1/4". 5 per pack. Store boxed samples safely in your freezer. Corrosion-resistant stainless steel racks have handles for easy transport. Vertical racks fit chest freezer: horizontal racks fit upright freexers. Racks fit 5 1/8" x 5 1/8" and 5 1/4" x 5 1/4" boxes. Store cryovials easily-boxes fit in liquid nitrogen and mechanical freezers in horizontal or vertical storage racks. Select a box and partition that fit the size and number of cryovials. Both the boxes (lids included) and the partitions sell in packs of 12. HS2860A Cryovial Box and Lid, 5 1/4" x 5 1/4" x 1 7/8"
HS2860B Cryovial Box and Lid, 5 1/4" x 5 1/4" x 2 7/8"
Durable polypropylene rack fits in standard 5 1/4" square freezer modules and holds 1.5 to 2.0ml microtubes and cryovials. Features molded grid lines on the lid, imprinted coordinates on the bottom of the base and a molded reference point on the lid. Rack measures 5 1/8" x 5 1/8" x 1 3/4. 5 per pack. Create as large a rack as you need by linking together multiple racks. Heavy-duty polypropylene racks feature a unique system of tabs and slots, which facilitate easy connection and sturdy fit. Polypropylene racks connect to one another on either end. Convenient finger slots are molded onto the rack making them easy to pick up and move. Each of the three tiers accommodates a different sized tube. CUBE RACK - Interlocking on all sides! Slide these polypropylene racks together in multiple orientations - work with different sized tubes at the same time. Each cube rack can hold (4) 50ml conical tubes, (10) 15ml conical tubes, (12) 12 x 75 or 12 x 100 tubes or (16) 1.5 to 2.0ml microtubes. Autoclavable. Rack measures 4 1/4" x 4 1/2" x 4 1/2". 5 per pack. This reversible rack comes with a simple-to-use removable hinged lid that snaps in place on either side of the rack. Rack and lid are molded out of autoclavable polypropylene. PCR side of the rack has 168 wells that hold 0.2ml tubes. The wells will accommodate 8 or 12 tube strips or individual tubes. The opposite side of the rack has 40 wells that hold 0.5ml tubes. We have also placed 12 wells for 1.5ml tubes on both sides of the rack for your convenience. Rack measures 8 1/8" x 5 1/8" x 2 1/8". 5 per pack. Polypropylene rack has 96 wells to accommodates 0.5ml microcentrifuge tubes on one side or 96 wells for 1.5 to 2.0ml microcentrifuge on the other side. Arranged in standard 8 x 12 array. Handy lid snaps into place in the tabs on each end of rack. Grid lines are molded on the side of the rack that accommodates the smaller tubes making it easier to see the wells. Raised rings are molded on the opposite side of the rack making it easier to replace the 1.5 to 2.0ml tubes from those wells. Rack measures 9 3/4" x 4 3/4" x 1 7/8". 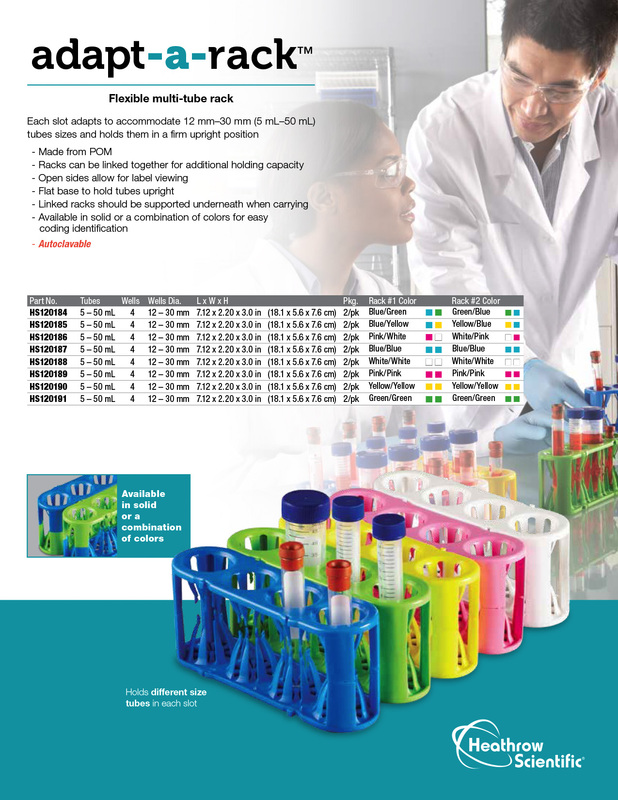 PCR Rack is perfect for pre or post-PCR® sampling applications. Sturdy polypropylene rack accomodates individual 0.2ml tubes or strips of 8 or 12 tubes. Tube wells are easily identified with imprinted numbers and letters. Rack measures 5 1/8" x 3 7/8" x 1 1/4". 5 per pack. A real time saver for anyone working with individual 0.2ml tubes or strips of 8 or 12 tubes. Transfer tray is a thin strip of plastic designed to rest perfectly over a 96-well tube rack. 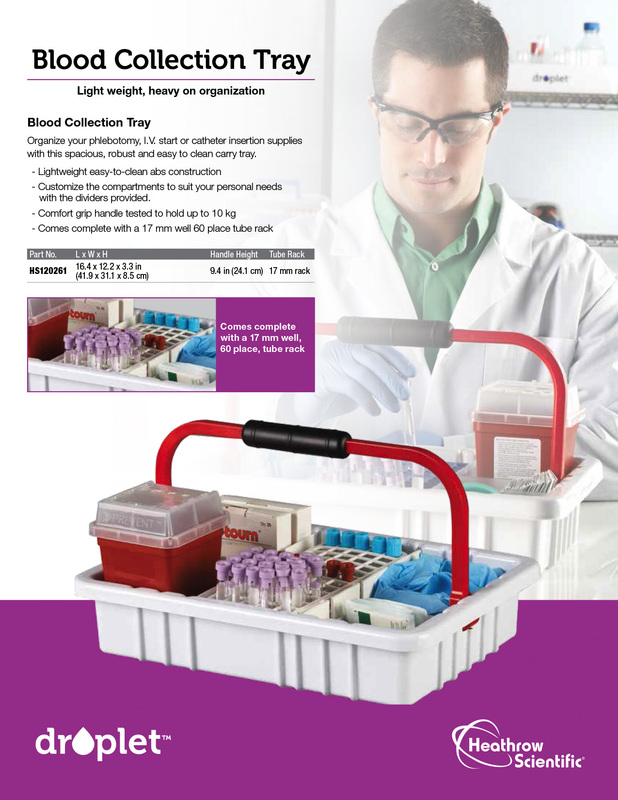 When it is time to move the 0.2ml tubes to the thermal cycler it is super simple with this tray - just use handles to lift and carry. Made out of high impact polypropylene. Clear acrylic rack houses 96-well, 384*well and other microvolume plates. Features rubber feet and a hinged door. This rack takes up very little space and keeps plates protected, yet readily accessible. Box measures 5 3/8" x 4" x 6", with 3/4" of space between the shelves. Brightly-coloured, high-density polyethylene foam racks are ideal for floating tubes in water baths, tubs or beakers. Closed cell foam is resistant to water absorption so racks can be washed and reused. Foam handles make it easy to lift samples out of baths. The blue round rack features unique "X" slits to hold a variety of tube sizes. Racks include carrying handles. 5 per pack. These culture tube racks are constructed of chemical and solvent resistant polyester foam. Tubes fit securely in the sockets. Choose between racks with 50 or 30 wells. 6 per pack. Six of the most popular racks come neatly packed in a clear plastic Tubby® with a snap-in-place lid and three removable dividers. Create storage compartments for tubes, tips, slides and more. All plastic racks and Tubby® are constructed of autoclavable polypropylene. Racks come in assorted colours that may vary with order. Rack holds 1.5 to 2.0ml microtubes in a 5 x 16 array. Tubes sit in large wells with conical bottoms. Polypropylene rack is ideal for freezer storage. Autoclavable. Rack measures 8 7/8" x 2 5/8" x 1 1/8". 5 per pack. Quickly chill sample tubes. Two-piece rack has a lower section tray which can hold water or crushed ice. Top inset tray secures tubes. Molded polystyrene racks are designed to stack on top of each other to save benchtop space. Cat No. Tubes Wells Colour L x W x D"
HS28230A 1.5ml 50 White 10 3/4" x 5 1/2" x 2 1/8"
HS28230 15 and 50ml 15 White 10 7/8" x 6 1/2" x 5 1/4"
Organize a large number of microtubes easily on your benchtop. Accommodate up to eight 80-well microtube racks with either 1.5 or 2.0ml microtubes in the racks. Plenty of room to slide the racks in and out. Vertical rack measures 9 1/4" x 6 1/8" x 9 1/4"; horizontal rack measures 12 1/4" x 9 1/4" x 4 7/8". Durable tube racks are constructed of two sturdy pieces of expanded polystyrene )EPS). Extra spacing between wells allows you to easily pick out tubes. Round feet and stops make the racks stackable for maximum space efficiency. 50-well rack measures 8 1/4" x 4 1/4" x 2 3/4"; 100-well rack measures 13 1/4" x 3 3/4" x 2 7/8". 10 per pack. These chemical resistant, epoxy-coated steel wire racks have a slotted bottom for secure handling. Ideal for conical centrifuge tubes but can be used to hold other types and sizes of tubes. The 15ml rack has 20mm holes; 50ml rack has 30mm square holes. Autoclavable. Easy-to-assemble, polypropylene racks snap together securely. Designed for stable use in water baths. Alphanumeric grid reference aids with tube identification. Autoclavable. Shipped flat. Wells for 15ml tubes measure 17mm diameter; wells for 50ml tubes measure 28mm diameter. Select among our three one-well racks - epoxy-coated steel wire racks, interlocking polypropylene racks or friction-fit polystyrene racks. Friction-fit racks securely hold conical or round bottom tubes with 27.5 to 29mm OD. Link the interlocking plastic racks to form a line of 50ml tubes. Both the wire and interlocking polypropylene racks are autoclavable. The chemical-resistant, epoxy-coated steel racks feature a slotted bottom and reinforced edges. The tubes sit securely in the square holes and the middle rung of the racks provides added support. Use smaller 72-well rack where space is at a premium. Autoclavable. These racks feature three tiers for tube support. The polystyrene tiers are clear in colour for easy viewing. They come unassembled but take just a few seconds to put together. The ABS endplates are convenient for applying identification labels. Easy-to-assemble, polypropylene racks snap together securely. Designed for stable use in water baths. Autoclavable. Sturdy polypropylene racks are ideal for the drying or storage of tubes. Peg design allows for the easy viewing of enclosed tubes. Drainage holes will cause racks to sink in waterbaths. Autoclavable. Manufactured from stainless steel, these "Z" racks are rust-proof and will hold up to repeated use. The wide base provides stability and prevents tipping. When not in use, the racks stack neatly inside one another to conserve benchtop space. Alphanumeric grid reference. These easy-to-assemble racks break down in a snap for storage. High-density polyethylene is resistant to most common laboratory chemicals and can be chemically sterilized (not autoclavable). Epoxy-coated steel wire rack is ideal for conical bottom centrifuge bottles that can not stand by themselves. Will accommodate round bottom tubes as well. Bottom rails hold bottles securely upright. Holds bottles up to 250ml (60mm diameter). Autoclavable. Designed with 8mm (5/16") thick acrylic for use with Beta-emitting radioactive isotope samples. Sturdy, solid acrylic block holds eight 1.5ml microcentrifuge tubes. Snug lid ensures secure fit. Measures 3 1/2" x 1 1/2" x 2 1/4". 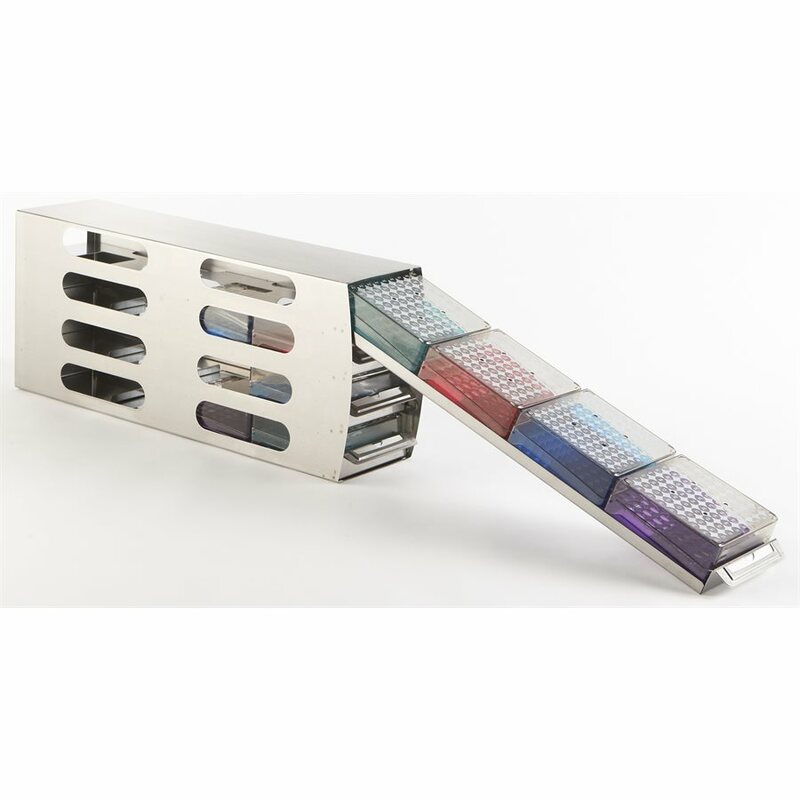 The innovative cuvette rack holds up to 12 cuvettes of 10mm light path. Features a hinged lid with secure clasp. Molded polypropylene rack includes a removable insert for easy cleaning. The height of the lid will accommodate the tallest of spectrophotometer cells - even those with covers or stoppers (maximum 51mm H). Racks stack neatly to save space. Drain and dry test tubes, beakers, flasks and other labware. Place self-standing rack on a table or near a sink. Or use hooks to hang rack on the wall. Hold up to 90 pieces on eighteen 5" pins and seventy-two 3" pins. Made of spot-welded steel wire that is vinyl coated. Slide the drainage pan to the side for easy emptying. Overall dimensions 18"W x 71/8"D x 19"H.
The sharp, tungsten carbide tip easily etches glass, ceramic and plastic. 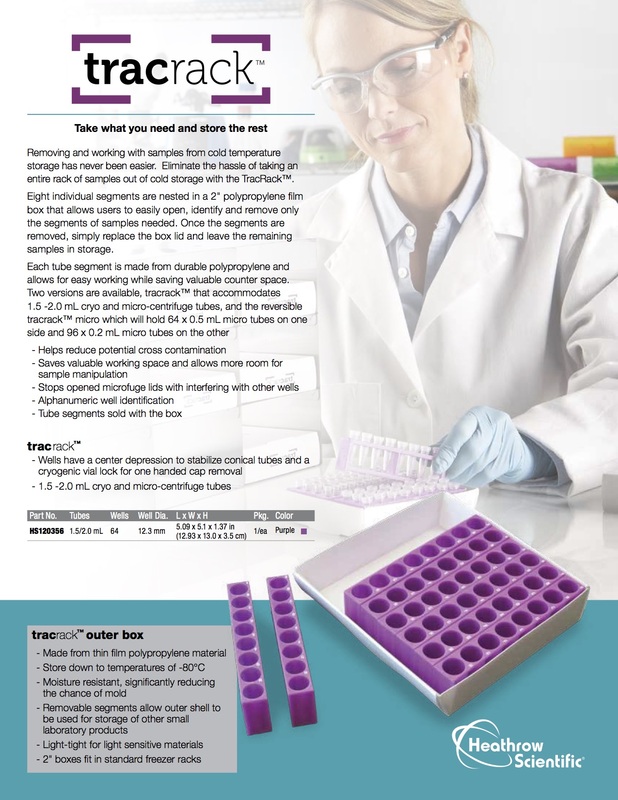 Use on test tubes for easy reference or on tube rack for permanent studies. Retractable pen tip allows safe storage. Measures 3/8" diameter x 5 1/2" length. Heathrow Scientific product line consists primarily of laboratory plastics such as microscope supplies, various sizes and configurations of tube racks, weighing boats, pipetting aids and liquid measurement products. 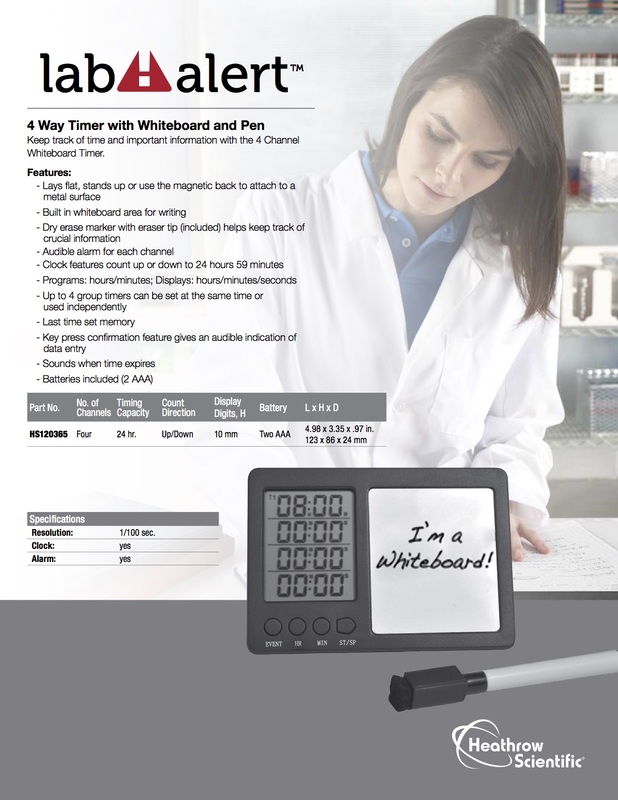 They also offer several different timers, bag sealers and mechanical counters. Heathrow Scientific's products provide all the standard benefits laboratory technicians demand, but with unique features that make the products easier to use and more convenient. Download Heathrow Catalog here.